How I gained it: I was always skinny growing up, even in my teens when I began to eat junk all the time. A normal lunch was two double cheeseburgers, six chicken nuggets, a large shake and a pie. Dinner was usually more of the same or canned spaghetti and meatballs. I also ate candy bars, chips and ice cream all the time. I never put on a pound because I was young and active. In 1995, I weighed 140 pounds, and was actually a little underweight. Then, I got engaged, settled down and became very sedentary. My day consisted of sitting at a desk with a bag of chips and a couple of candy bars. Then, I would eat drive-through junk for lunch. My wife is a fabulous cook, and would make wonderful lasagna, stuffed shells, etc. for dinner every night. In between all of that, I would down about two liters of soda every day. Exercise was something other people did, not me. Sit on the couch watching TV is what I did. My sedentary, lazy lifestyle, combined with just awful eating habits, packed the pounds on pretty quick. Even though I knew I had gained weight, I was in denial. I kept telling myself everyone gets heavier as they get older. I told myself that for 13 years! Breaking point: The breaking point for me was being sick all the time. Before I got heavy, I rarely even caught a cold, but during the last few years, I caught nasty colds all the time, and the flu would whack me at least a couple of times a year. In February of 2008, I had a terrible flu that I couldn’t shake, so I went to see a doctor. On the way into the doctor’s office, the nurse weighed me on the super-accurate medical scale. I could not believe what I weighed: 211 pounds! I stand 5 feet 10 inches tall, so that was way too heavy. At that moment, it clicked. The thought of heart attack, stroke, diabetes, clogged arteries and possibly leaving my kids with no father ran through my head. Even though I knew for years I was overweight, I finally decided to do something about it. I also felt that if my body was in better shape I wouldn’t get sick so often. I realized I needed to change my attitude about food and exercise. I looked at the wrapper after eating a greasy burger, and saw all that fatty grease. It’s pretty disgusting. Would you lick the grease off a burger wrapper? Heck no. So, why eat all the fat and grease in the burger? 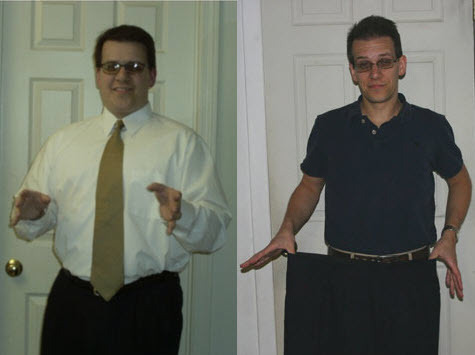 How I lost it: I lost the weight when a Subway restaurant opened a block from my office, and I stopped eating fried fast food every day for lunch. 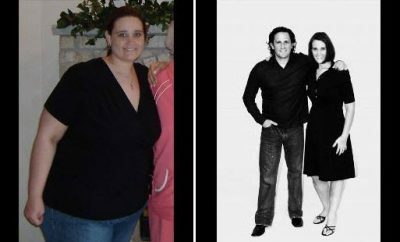 From there, I began to eat healthier at home, and developed a 15-minute exercise routine I do every day at home. I also switched to diet soda, which may not be great for you, but is far better than regular sugary soda. I have not eaten fast food in over a year-and-a-half, and I conditioned myself mentally to avoid fatty foods such as doughnuts, cake and candy. It takes will power to keep it off, but I have found it easy to avoid these foods. I now eat from the Fresh Fit menu at Subway for lunch, and eat smaller portions of healthier foods like chicken and turkey at home. My 15-minute exercise routine consists of 50 push-ups, 50 reps lifting 20-pound dumbbells on each arm, 100 jumping jacks and 20 reps of chin-ups on the Iron Gym. I have not only lost weight, but I have good, lean muscle tone. I can do this complete workout during half-time of a football game. Very easy, but very effective. The Tony Robbins concept of “chunking” says that breaking a hard task into smaller, manageable chunks makes completing the task easier. That’s how I approach exercise. Breaking 90 minutes of exercise into 15 minute chunks makes it less daunting, and I believe it is more effective because it is done daily. It took Ted six months to lose his weight, and he has kept it off for 14 months. He hasn’t been sick since that nasty flu took him to the doctor. Ted lost weight, in part, because of his kids. Leeann did, too.